← How we grow crops. The idea of growing grain in a backyard garden is not something most gardeners would even consider. The common belief that efficient grain production requires large equipment, like combines and tractors, is not altogether right. A sizeable amount of quality, organic grain can be grown using a tiller and hand tools in a backyard setting. Wrapping your mind around some simple concepts like “a thousand square feet of garden bed space can yield enough wheat for 50 loaves of bread” or “a 100 square foot bed of Dale Sorghum can yield 16 pounds of grain for flour or chicken feed, as well as 1 gallon of delicious syrup.” Both of these scenarios will also provide straw or biomass for use as mulching material and/or compost building. Grains (considered a carbon crop as well as a staple crop) can play a crucial part in building healthy soil and maintaining fertility. think about 2 classes of grains: spring planted and fall planted. Spring planted grains would include barley, corn, oats, rice, triticale, amaranth, quinoa, sorghum, millet, teff, buckwheat, and some types of wheat. Fall planted grains in our region would include winter wheat, some types of barley, and rye. Fall planted grains are usually harvested in the mid-summer of the following year. Spring planted grains are generally harvested in late summer to early fall. Many of these grains can be planted by broadcasting by hand or planting using nothing more than a fork, hoe, and rake. 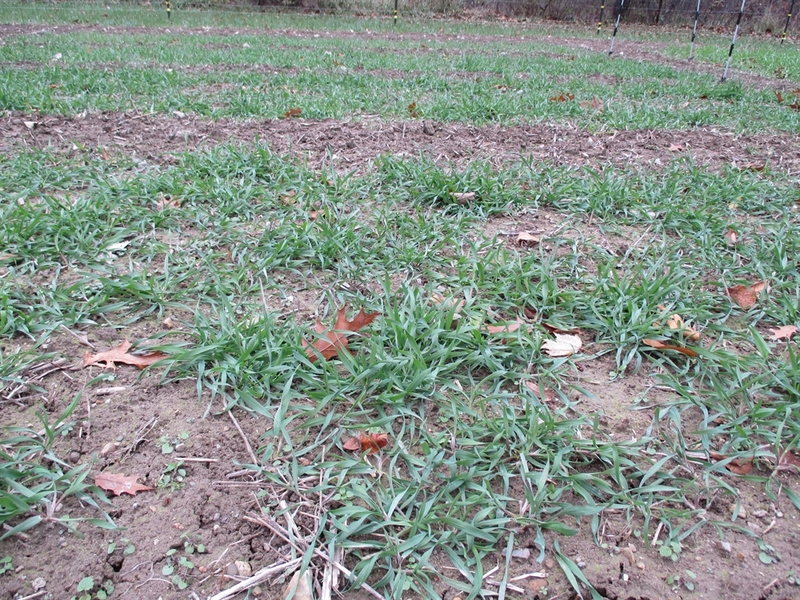 Grains like wheat, rye, barley, oats, and buckwheat can successfully germinate on top of the soil after hand broadcasting, given that the beds are kept moist until germination. 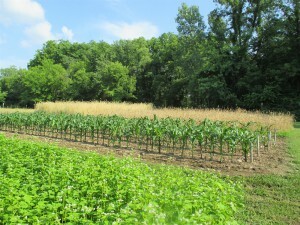 Grains like corn, sorghum, and millet require planting to a depth of approx. 1/2″-1″ in rows. Rice, quinoa, amaranth, and teff are best started indoors a few weeks before setting out as transplants in late May. 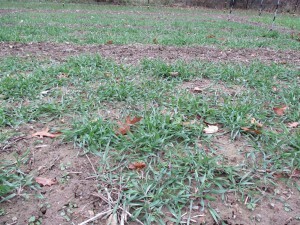 Lodging in rye plot after heavy rains. 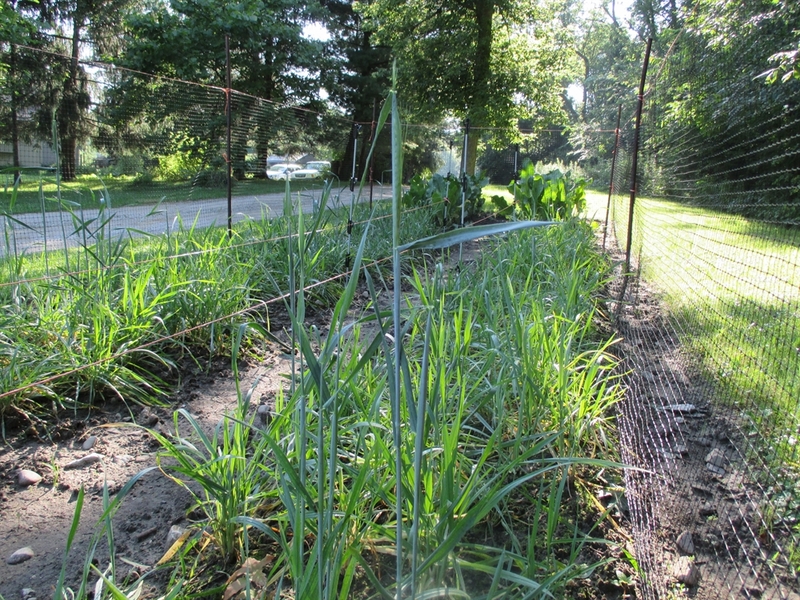 Small scale grain growing, especially when raising heirloom varieties, may require staking your beds in order to limit lodging. Lodging is when grains (especially tall grains like sorghum and rye) fall over due to top-heaviness, heavy rain fall or wind. 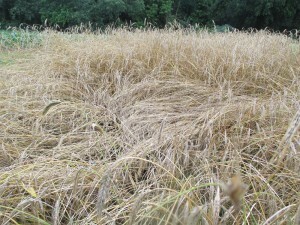 Once grain is laying on the ground it becomes difficult, if not impossible to harvest. I stake up my grains, like rye, by driving posts or stakes at 1o’ intervals around the periphery of the bed. Twine is then strung at various heights around the outside of the bed to keep the grain stalks from falling over. Some grains like milo (a type of grain sorghum) and modern wheat varieties stay short and have little problem with lodging. 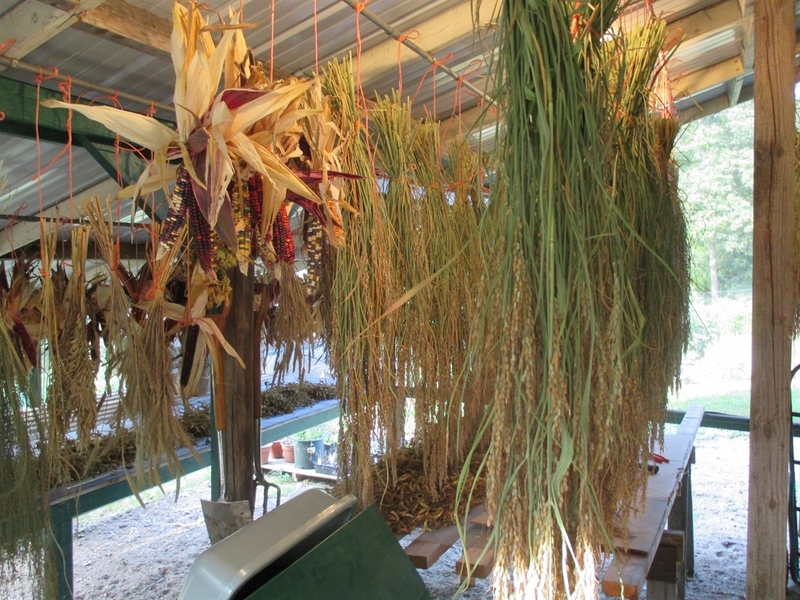 Painted Mountain corn and Duborskian rice hanging in drying shed. Harvesting can be accomplished using a variety of hand tools from the simplest, like scissors and the sickle, to the more advanced scythe (simple in design but requires lost of practice to use efficiently). A crucial factor for grain harvesting is timing. In Indiana that can be problematic when the optimal harvest time coincides with a heavy summer or fall rain. Grains like quinoa, amaranth, and teff are typically grown in warm arid regions of the world. This is why they are absent from commercial agriculture in our area. The small scale grower has the advantage of flexibility. 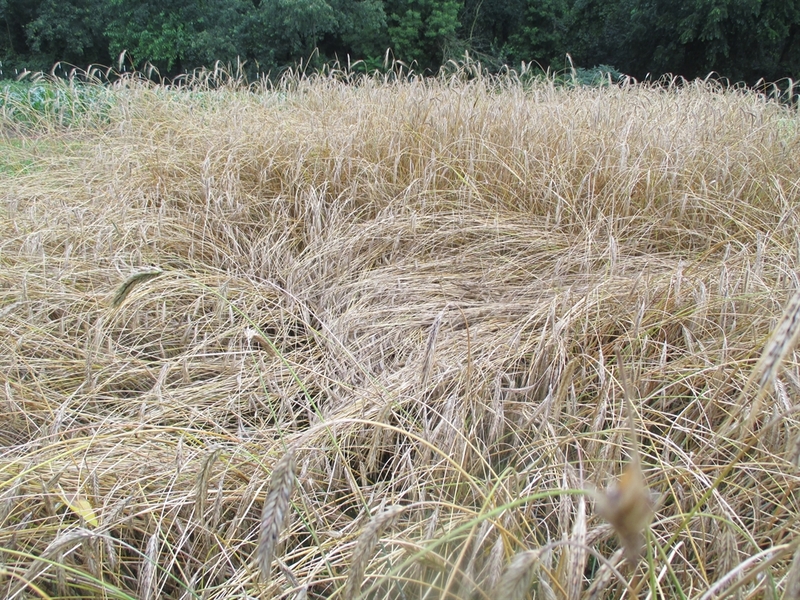 Small plots can be harvested quickly, and in many cases the bundled grains can be brought into a barn, drying shed, or garage to dry and cure. If detrimental weather threatens, many grains like teff, sorghum, quinoa, and rice can be harvested before peak maturity and hung to further mature and dry until ready to thresh. 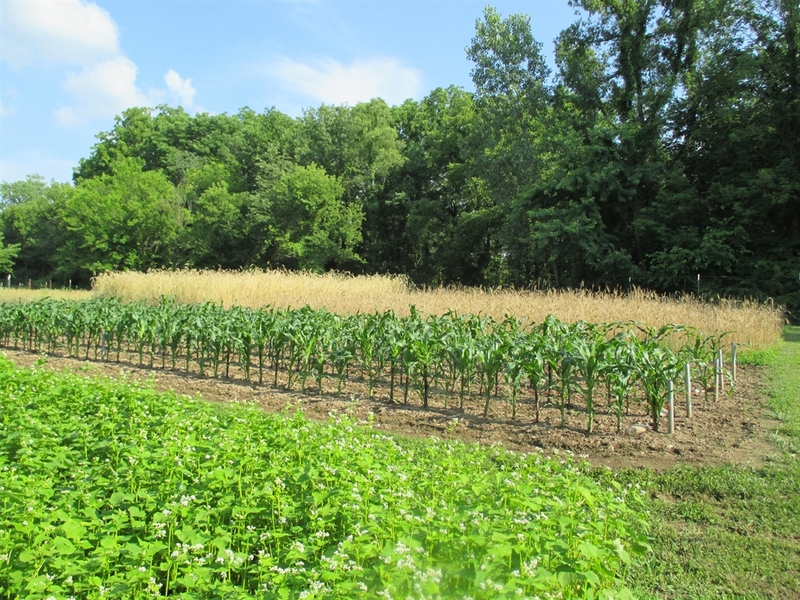 Yields will be smaller, but the quality will not necessarily be inferior for home use. The next step is threshing and winnowing your grains in preparation for storage. 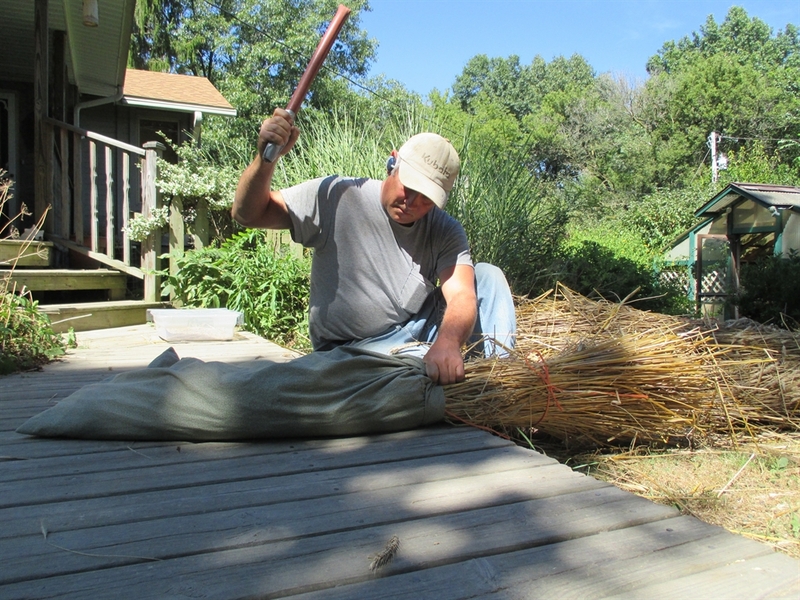 Hand threshing with a pillow case and piece of rubber hose. method is flailing. I use a piece of heavy rubber garden hose bent in half and wrapped with duct tape where the two ends meet. This end is the handle. 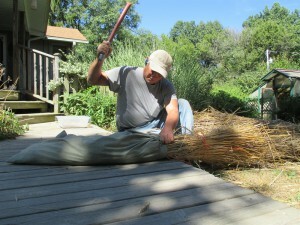 I place a bundle or two of grain, seed head first into a heavy-duty pillow case. I thresh on a hard surface like cement or a wood deck. The grain is beat with one hand while holding the pillow case closed with the other. 5-10 whacks on one side, then flip the pillow case over and give 5-10 whacks on the other side. The grain should come loose from the stalks and be ready for winnowing. This process is adequate for cereal grains like wheat, rye, oats, and buckwheat (not actually a true grain). Millet, sorghum, teff, quinoa, rice, and amaranth require a different threshing method. To accomplish this by hand, I simply place the grain heads into a tub and work the grain free by rubbing it vigorously between my palms. You may need a thin pair of leather gloves to keep from tearing up your palms. Corn is done in a similar fashion and is quite easy to remove from the cob. There are many other variations for threshing including the use of a mechanical thresher. I use a treadle-powered thresher for most grains, but rely on the hand method for teff, quinoa, millet, and amaranth. Winnowing is the process to remove loose chaff from the grain. I use a fan and two tubs for this process. Simply pour the grain from one tub to the other in front of the fan. The air flow will blow the chaff away and the heavier grain will fall into the tub. You may need to do this three or four times for very clean grain. Teff, quinoa, and amaranth require a little experimenting with the distance of your fan from your tubs. These grains are very tiny and light and can easily be blown away with the chaff if you’re not careful. For most grains there is little else to do at this point except store and consume. Some grains like rice have an inedible husk which needs to be removed before consumption. Also, some types of barley, millet, oats, and ancient wheat have a husk that needs to be removed for human consumption. There are many options for hulless barley and oats and modern wheat like “hard red winter” which thresh easily from the hulls. Small-scale dehulling equipment can be difficult to locate. Rice can be beaten with a mallet to loosen and remove the hulls. This works, but you will crack a lot of the rice grains and it is time consuming. Lastly, quinoa needs to be rinsed thoroughly (5-6 times) to remove the “soap-like” saponin coating on the grain before cooking. Storing grain is easy if you follow a few simple points. Grains with hulls store better if the hull is left on. Grain should be very dry before long-term storage. Dry grain should be placed in airtight containers and stored in a cool dark place. One major consideration is insects. Your grain may harbor insect eggs, like pantry moths, which could destroy your crop if left unchecked. I store my grains in air-tight plastic quart freezer containers. Every container spends 5-6 days in my freezer before being stored away. The lack of air and the freezing temperatures should kill any insects and their eggs. A traditional method of grain preservation is to roast or cook and dry the grain before storage. This works great but will not allow your seed to be viable for next season’s planting. Two small beds of Shademaster Triticale. are many excellent books available on the subject for more detailed information. Two excellent resources are Gene Logsdon’s Small-Scale Grain Raising and The Organic Grain Grower by Jack Lazor. I believe that raising your own grain on a small- scale is not only viable, but essential to a holistic, sustainable, food production system. This entry was posted in Grains, Methods, Rice, Uncategorized and tagged Carbon Crops, Duborskian rice, Northern Indiana Seed, Small Scale Production, Staple Crops. Bookmark the permalink. I love your site and the experimental work you are doing. I am new to growing grains, but have had some very encouraging results from my wheat and oats and plan to try some new varieties each year. A few ideas. In the picture of your rye that lodged, it looks dead ripe. You might want to harvest before this stage and let it dry in a barn instead of in the field. This prevents bird and animal damage to the ripe grains and also means the grain is exposed to damaging weather for less time. Second, if you save seed from lodging-prone crops with special attention given to stem strength and lodging resistance, the variety should slowly improve in this regard (I’m sure you know this). Your blog is very interesting and I’m in the process of reading through all your old posts about grain growing. I’m located in central Indiana and I’d love to check out your operation some time. with new crops needing harvested almost daily. one of the advantages small scale growers have over large scale production. varieties, selection and seed saving are crucial to future food security.